We’re one step closer!! Today I got the chance to try out some great pre-release technology from Adobe. 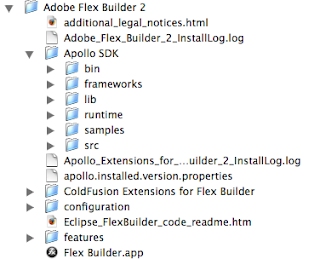 The Apollo Extensions for Flex Builder is a small installer that adds Apollo Application capabilities directly into Flex Builder. I tested the build on the Mac. CAVEAT: Nothing you see here may eventually make it into a GMC build. This is just a heads up. I suspect some of you might want to jump on the first Apollo Public Beta when it is available. For those of you who do not yet know Apollo, Apollo is an internal working name for a technology that takes Flex Applications outside the browser. You can also incorporate HTML alongside your SWF’s to build standalone applications that can interact with local system resources. Apollo applications are built using MXML, the declarative programming framework and language used by Adobe Flex. 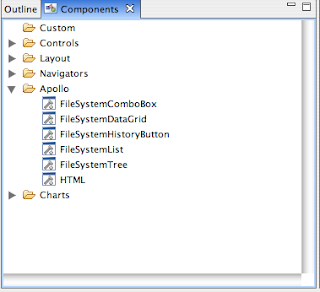 Before doing this, there were several manual steps one had to go through in the Flex Builder in order to create an Apollo Application including importing the ApplicationWindow *.swc to the Flex Builder Environment and changing the namespaces manually in order to get Flex Builder to compile the MXML into an Apollo Application. The install of the extensions is really simple. The 20 MB download for Mac extracts into the installer. Double clicking on it opens up the install dialog. On the third screen I recommend just hitting “next” and using the default location. 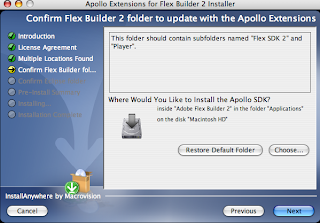 Note that you must have Flex Builder installed prior to installing the Apollo Extensions. A post mortem on the directory reveals a wealth of Apollo wizardry installed during the process. Just look at all the Apollo goodies I now have! 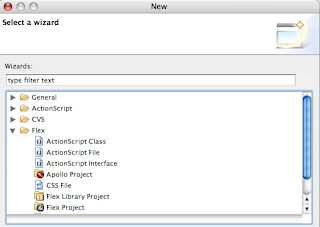 When I launch the Flex Builder and start a new project, I have the option of creating a new Apollo Project. Additionally, under the components browser, there is a new category called Apollo with some extra goodies in it for Apollo Developers. You can use these in addition to the stock Flex components to mix and match and build your application. I quickly whipped up a UBL (Universal Business Language) application as a standalone app to work with UBL. No – it is not finished yet but it shows the real power of Apollo. The real magic happens when you hit the run button. Instead of the Flex Application building a SWF experience inside an HTML page, it launches a standalone application. 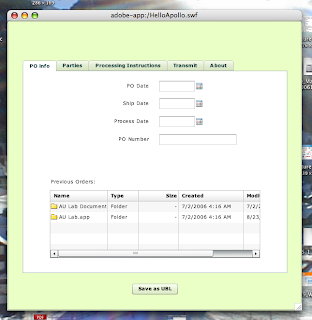 The screen shot below show the small application I built on the Mac OSX (intel). This technology is going to change a lot. The application above took less than 15 minutes to create the GUI for. Others have built some really cool applications like the Ascension MP3 player (screen shot below). This application, written by Apollo guru Mike Chambers, can load a local itunes library file and songs referenced on it, has several visualizers and controls for the audio files and can also search on the web for photos from Flickr based on the metadata in the audio files. 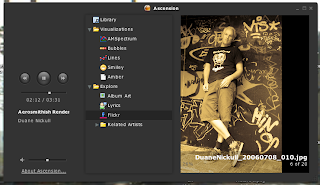 I loaded up one of my own songs from Mix2r.com and the Ascension application read my name on the ID3 tags and searched Flickr and found this photo. This is yet only the beginning of what is possible.